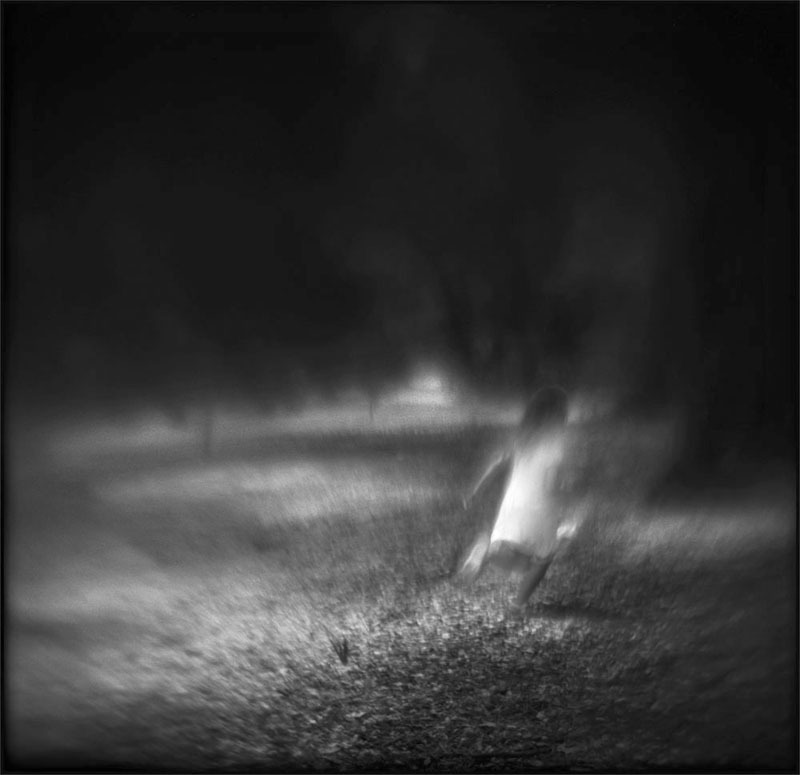 Susan Burnstine’s first photobook, Within Shadows, is an accumulation of interpretive photographs defined by three themes, titled “On Waking Dreams”, “Between” and “Flight”, which in turn are derived from her dreams and nightmares. As such, it is an autobiographic oeuvre that traces its creative roots to Duane Michals, Minor White, Jerry Uelsmann and Ralph Gibson in attempting to investigate allegorical and emotionally symbolic concepts. Burnstine photographs predominantly portray a solitary female model, whether a child, adolescent girl or a young woman, who is a surrogate for herself and who is temporarily standing in Burnstine’s emotional shoes. She observes individuals in various found situations, watching for compositions which imply symbolically the concept she is attempting to convey. For the theme “Between”, she provided her models with a concept of an emotion that Susan had experience and then observed them from a distance. I sense that her photography is a cathartic process to release demons in an attempt to confront them, exercise them and possibly move beyond them. Even her celebratory and joyful photographs have a subtle dark lining. An element to Burnstine’s creative process that she feels adds significance to her photographs is her introductions of cameras she constructs or modifies. Her camera designs introduce elements which might traditionally be considered photographically sub-optimal. As an example using a soft focus leaving indistinct marks on the paper, in conjunction with area of sharp focus that seem to float in and out of the photographic frame. The resulting effect creates a dream like quality, as though drifting in and out of conscious. By using film equipment that might be considered defective is subsequently introducing unplanned events, thereby adds chance, surprise and serendipity to her discovery process. 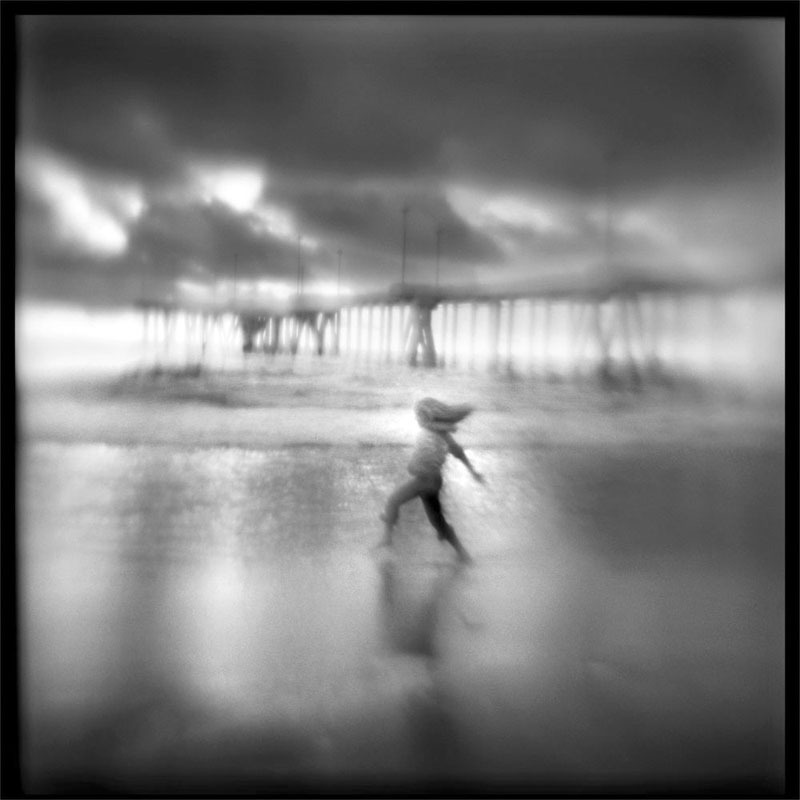 This equipment in her hands allows her to create photographs that are abstract, vague, and impressionistic, with hazy and indistinct features. Reminiscent of the Surrealist’s Auto-drawings, she is open to unanticipated results, running counter to studio practices and the digital Polaroid generation. Still with a certain amount of experience in working with each of her cameras, I expect that she is still able to pre-visualization and anticipate what type of effect that each will introduce. Similar to the calculated chance of a street photographer, who pans their camera with a subject during an extended exposure, not sure what exactly might be captured, but knowing that there will be blurring and perhaps some magical quality that might emerge. 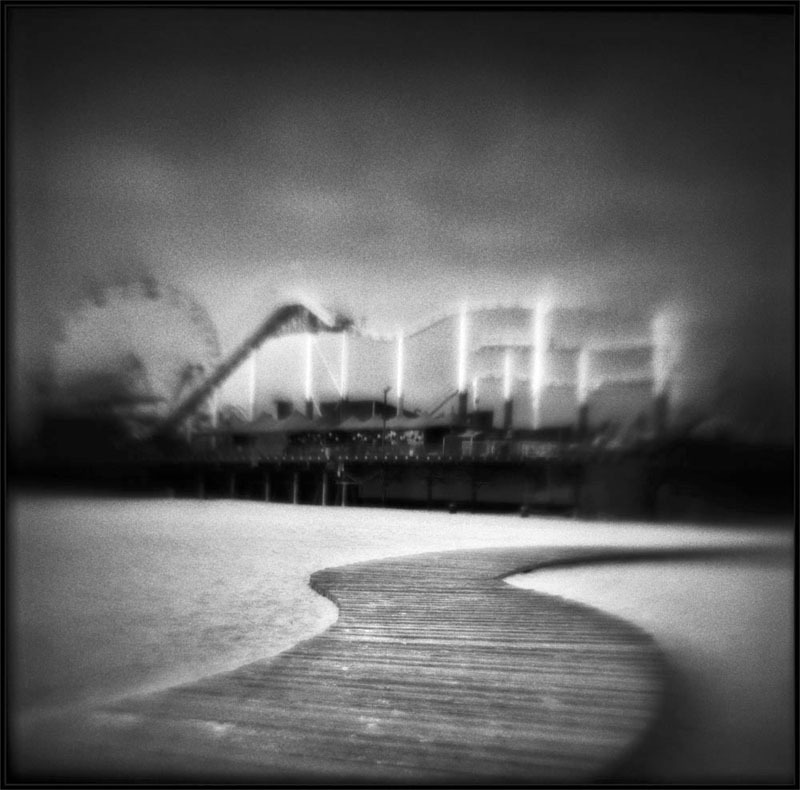 To illustrate this dream world, Burnstine uses a Black & White medium in which her modified camera equipment expands the contrast range, vignettes and further modifies the image. The subsequent effect provides an illusion similar to burning in vast areas with darker values to push beyond an objective reality. Her photographic boarders have either a thick black or darkened edges to enclose, limit and restrict the boundaries of her narrative. The underlying darkness of her photographs occasionally becomes almost palatable, the sober moodiness lingering so close to the surface. The word dream for me has peaceful connotations that would imply the ability to have an enjoyable and restful sleep, in contrast the word nightmare embodies a troubled and fearful condition that results in a turbulent and stressful sleep time without obtaining full rejuvenation. Fatigue, anxiety and stress can result from fitful and troubled sleep when haunted by nightmares, an inability to find peace. Nightmares seem to frequently convey more intense emotions, perhaps even to the point of jolting one into full consciousness. Plagued by fitful sleep and repetition of similar nightmares, an individual can feel powerless to escape the dreadful grip. Thus while she attempts to describe a dream, implying enjoyment and a positive experience of hope and fantasy, the portrayal has dark, ominous and threatening undertones, creates unsettling conflicts due to the visual contradictions. Nevertheless, I think what makes Burnstine’s photographs appealing to me is how she explores the darker side of our psych, for which we all at one time or another visit, some for longer durations than others. Her oeuvre runs counter to the saccharine sweet photographs of beautiful objects. It is though she is providing a strong dose of reality, that symbolically daily life has both its trials and tribulations, that adversity is mixed with joys and accomplishments. Our perspective will largely determine if a disappointing event will become a small annoyance or grow to be a huge let-down and as an autobiographic work, it appears that in Burnstine’s life there as many dark edges and a looming overcast gray cloud. 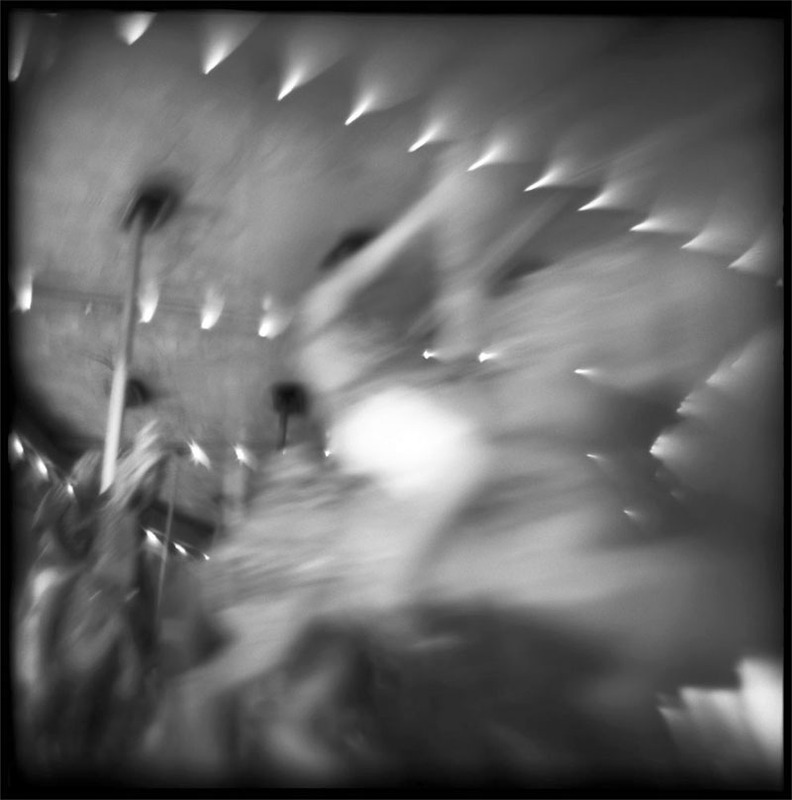 In the abstract photograph of the blurred carousel, provided below, I sense a representation of life, an experience that be either delightful fun, thrilling, entertaining, a wonderful fantasy of enjoyable experiences or trapped in a dreadful endless repetitive circle, with minimal variation, and the blur of movement and implied speed symbolic of going nowhere fast, and feeling dizzy, confused, disoriented and trapped, unable to stop or get off. This is also an aspect of nightmares that repetitively return with an inability to ward them off or make them go away. Soon there is a dread of sleep, as it seems that there is no control in stopping the relentless reoccurrence of these nightmares. 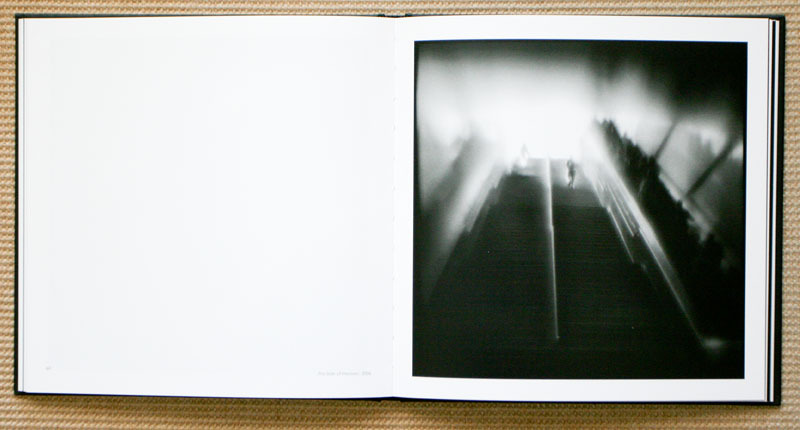 Many of Burnstine’s photographs include pathways, trains, stairways and passages, implying a journey that she is on. Sometimes the subject seems to move your eyes to light, and other times toward darkness. 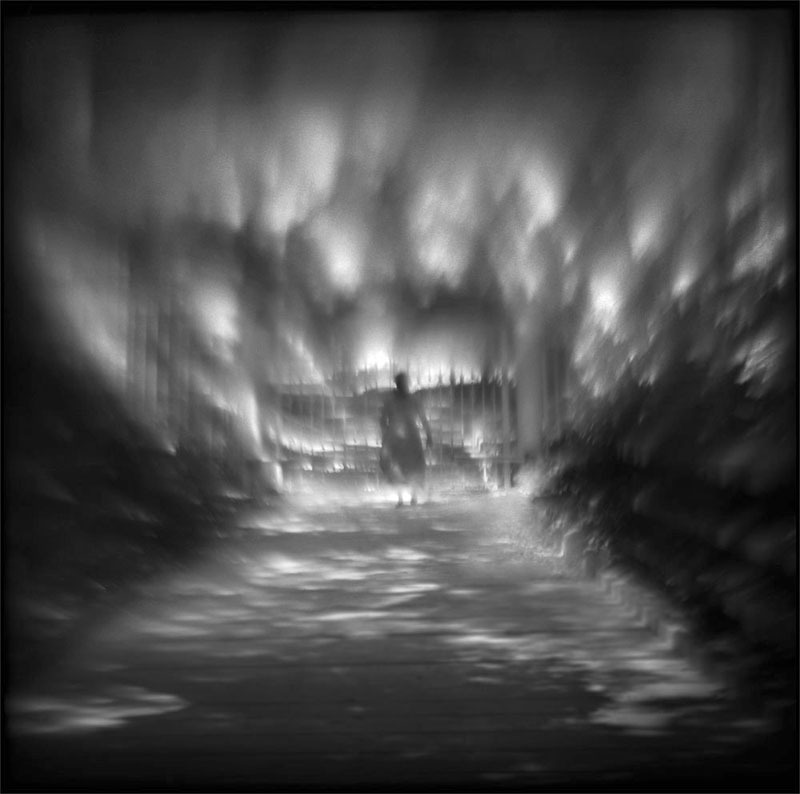 The journey appear to lead into spaces, dark holes, with very dark edges that appear to be closing in and alarming ominous in contradiction with the apparent activity being captured. It is not apparent as to where these journeys will lead. Another element is the inclusion of water; a pool that symbolizes the womb and birth, perhaps re-birth but with darker edges that can lead to a narrative of a fear of drowning, death and loss. In vetting her dreams, Burnstine creates contradictory narratives, a poetry noir, on the surface these are familiar and comfortable subjects, but with a dark and ominous undercurrent. Her photographs are ambiguous, eerie, unsettling, troubling, foreboding, disturbing, gloomy, and as such are infused with a strong sense of sadness and melancholy. As I stated earlier, I am also intrigued in how her photographs are equally symbolic of mankind’s conscious state. This is an interesting and diverse body of work, while there are a few photographs which I find boarding on cliché, Burnstine has nevertheless instilled even these with a unique and dream like quality. I am looking forward to her next body of work. As a photobook object, this hard cover book is printed and bound in Italy, and when comparing the book’s interior plates to an original print, the book’s printing appears to be spot on. The pages have a soft luster, and the paper has a nice weight and a luxurious feel to them. 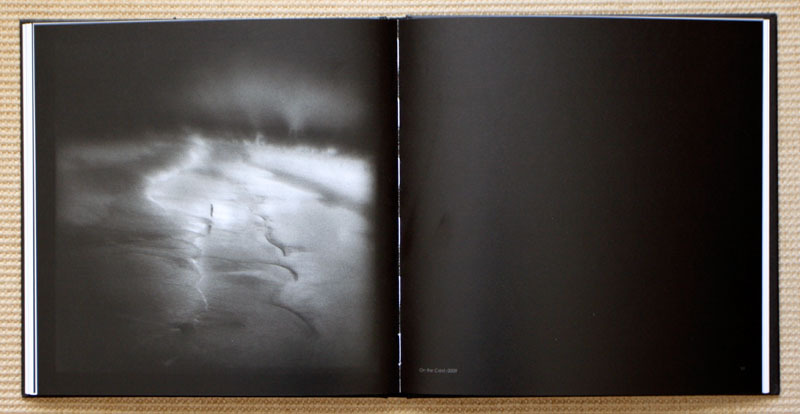 The vast majority of the photographs are printed on white pages, with some printed on a black spread, in which the white stitching of the binding is evident. When the plates are printed one photograph per page, there is a classic small white margin sounding the image. The pagination, photograph’s title, including the date, is provided on the page facing the photograph. The books smaller size, which reflects its European heritage, lends itself to easy holding, and although the binding is not absolutely lay flat, the book remains easily open and creates a delightful reading experience. Stunning photo! This photo speaks of nature’s beauty in a way that “no words” can. 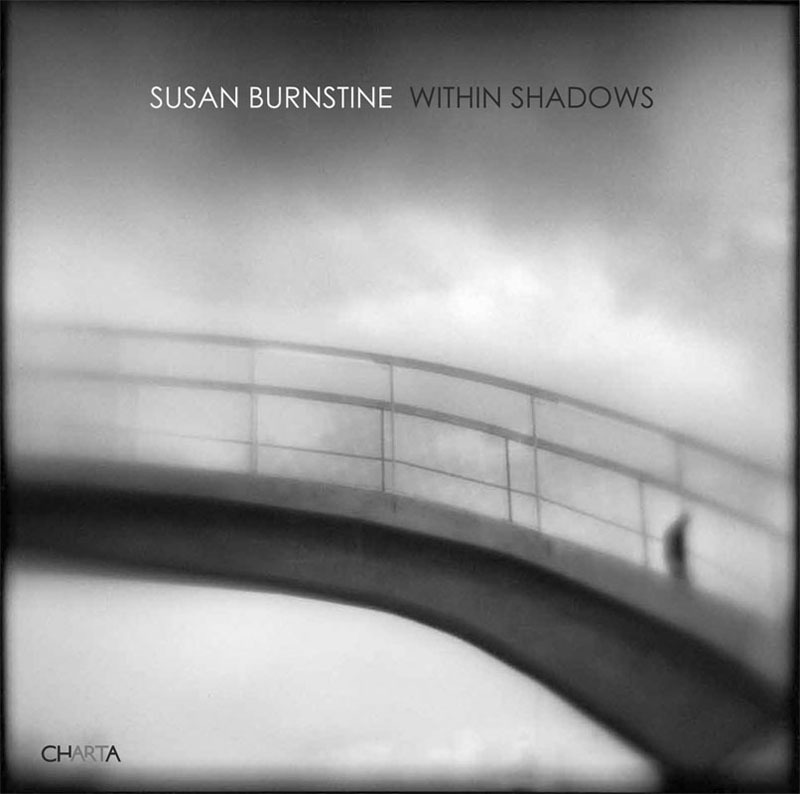 Doug, your review of Susan Burnstine’s book, Within Shadows, was right on target! Excellent commentary. Thank you for your insight.